You are here: Home / Astrology / Sun Enters Sagittarius Nov. 22: Get Ready for Fun! Welcome to Sagittarius time! The Sun leaves Scorpio and enters Sagittarius on Saturday, November 22, at 3:39 a.m. CST (9:39 a.m. GMT). It will remain there until December 21 (or December 22, depending on your time zone). No matter what your sign, you have Sagittarius somewhere in your astrological birth chart, so you’re affected by this change. Also, by “following the Sun”—that is, by paying attention to where the Sun is each month and aligning yourself with the current sign’s energies—you automatically put yourself in perfect harmony with the season, the stars, and your inner self. As the zodiac’s most optimistic sign, thanks to its big and jolly ruler, Jupiter, Sagittarius typically loves what’s big and showy and meaningful. This year, all those traits come into play right at the start of this sign: not only does the Sun barge in to fiery Sagittarius tomorrow, but the Moon rolls into the sign of the Archer on November 22 as well. In fact, the Moon will line up exactly with the Sun at 6:33 a.m. CST (12:33 p.m. GMT), giving us a new Moon in Sagittarius and a powerful double dose of this sign’s energies. That makes this weekend an excellent time to set new intentions related to all things Sagittarian. With so much Sagittarius energy available, we’re all likely to feel the call to adventure and a desire to be on the go and out having fun. With the winter holidays on the horizon, this is a good time to enjoy friends, parties, and new experiences. It’s also a great time to feel your inner optimism grow and your spirit of generosity expand. By next month, though, you may feel your energies start to slow down. Sagittarius’s ruler, Jupiter, will go retrograde on December 8 (meaning it will appear to be moving backwards in the sky, as seen from Earth). This suggests our best course is to enjoy outward activities early in the month of Sagittarius (so finish your shopping early!) so we’re ready to slow down a bit after the first week of December. As of December 8, set aside time to be at home so you can be alone with your thoughts. Despite the rush of the upcoming holidays, take time for prayer and meditation. 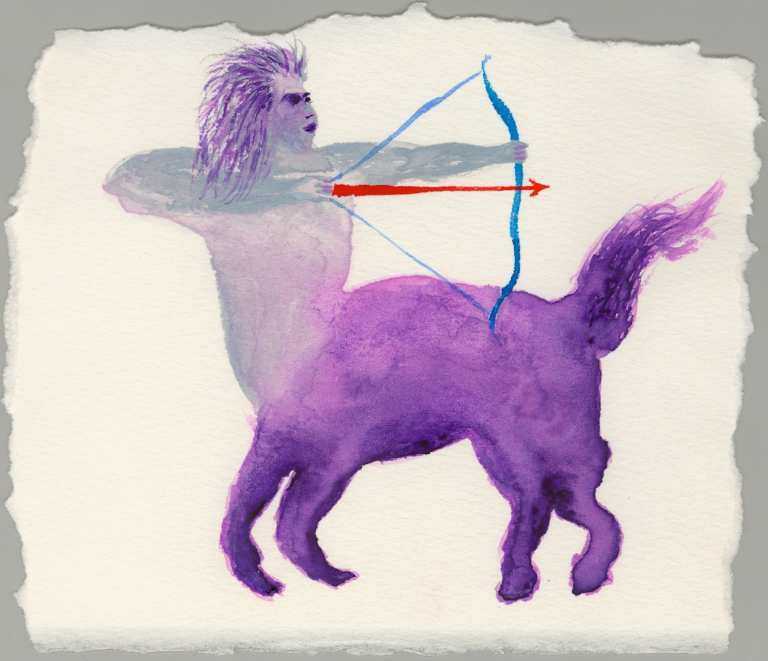 Sagittarius is the great philosopher of the zodiac, inviting us to contemplate the meaning of life, our place in the world, and the wisdom we have gained over the past year. 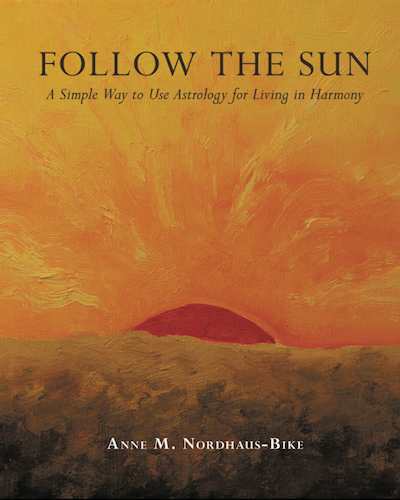 You can make the most of this month by checking out the Sagittarius chapter in Follow the Sun: A Simple Way to Use Astrology for Living in Harmony. This full-color astrology and art book gives you all the information you need about every sign and includes a special profile of a notable person for each sign to help inspire your dreams for your own life. It also includes the Sagittarius painting shown above (and paintings for all the signs), so you can harmonize with any sign at a glance. A color-coded box at the beginning of each chapter gives you all the details you need for each sign: zodiac dates, planet, symbol, asociations, and opportunities. Follow the Sun is available from the publisher at a special discounted price of $36.95. It also is available at Amazon.com, Barnes & Noble, and numerous other booksellers, or you may order the book through your local bookstore. For international orders and for other stores, distributors, and websites that carry Follow the Sun, see our list of online retailers.